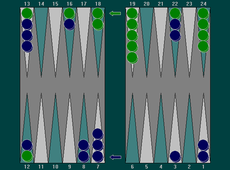 Tapa (Тапа) is a version of Backgammon played in Bulgaria and Macedonia. It is also played in Greece, where it is known as Plakoto. The word tapa means bottle cap. Tapa is usually played as the third game in a Tabla match, the first two being Tabla (similar to the common backgammon) and Gjul Bara. These 3 games are played consecutively in a match of 5. All 3 games are played on a standard Backgammon board. (Note that there might be slight differences in the match rules and scoring; the ones described here are common for Macedonia). Tapa is also played in Syria where it's known as Mahbousseh ( Arabic: محبوسة ). Each player starts with all fifteen checkers on the 24-point. It is usual, but not necessary, to place only 2 checkers at the start and add the others as the game develops. Since Tapa is not played as a single game, the user that won the previous game (Gjul Bara) in the match has the first turn. The checkers move around in opposite directions. The goal is to bring all checkers to your home board (point 1 to point 6) and then bear them off. The one who bears off all checkers first, wins the game. After rolling the dice a player must, if possible, move checkers the number of points showing on each die. The number on each die constitutes a separate move. For example, if you roll 5 and 6, you can move one checker 5 points and another 6 points. But you can also move a single checker 11 points (5+6), given that you have a free point (not blocked by the opponent) to land on in between, after moving the checker for 5 or 6 points. If a player rolls two of the same number (doubles) he must play each die twice. For example, upon rolling a 5 and a 5, he must play four checkers forward five spaces each. As before, a checker may be moved multiple times as long as the moves are distinct. Unlike Backgammon, there is no hitting in Tapa. Instead, if a player lands on a point occupied by a single opponent's checker, he places the checker on top of the opponent's checker and traps it. A trapped (pinned) checker can't be moved. Pinning a checker already used for pinning is not allowed. Two of your checkers on a point, or one of your checkers used for pinning an opponent's checker, create an anchor, a blocked point on which the opponent cannot land or touch down. A possible situation where the green is in trouble. Pinning an opponent's checker in your home board gives you a great advantage. Most likely you won't have to release it until you begin bearing off. The smaller the point where you pinned the opponent's checker is, the higher your advantage. If you pin an opponent's checker on the 1-point and don't have any of your checkers on the 24-point, you automatically win the game and get 2 match points (mars). After moving all of your 15 checkers to your home board, you can begin bearing off by taking the checkers outside the board. You can bear off checkers from points that correspond to the numbers on the rolled dice. If you don't have checkers on these points, but have ones on higher points, then you must play the move. If you don't have checkers on the points indicated by the dice and don't have checkers on higher points, then you bear off from the highest point that has a checker. If you have a pinned checker in your home board, you can't bear it off until it is freed. If you don't have checkers on the rolled points and have a pinned checker on a higher point that you can't move, you pass and do nothing. The player that manages to bear off all checkers first wins and scores 1 point in the match. If the opponent hasn't borne off any checkers, then the player scores 2 match points; this is called mars and corresponds to gammon. There is no backgammon and doubling cubes in Tapa, so you can't win more than 2 match points with a single game. Basically, there are 2 different strategies. This includes building anchors near the starting points and carefully progressing toward your home board, not allowing to be pinned. At the same time, you should wait for a good opportunity to pin opponent's checkers as close to your home board as possible. At the very start, you move checkers as far as possible, even leaving single checkers in the area of 10-point to 15-point. With this you open up a possibility to pin opponent's checkers in your home board or very near it, before the opponent gets a chance to build anchors. This strategy involves a certain amount of risk, since the opponent gets higher chances to pin your checkers and make a faster progress in building anchors closer to his home board. Some players prefer one strategy over the other, but this is a mistake. What strategy you use should be determined by the first few rolls. If you roll smaller numbers at the start, then you should use defensive strategy. But if you roll high numbers, you should try placing a checker around the middle-points. In the next few rolls you should try to either pin an opponent's checker or make an anchor with a second checker. If you fail and get pinned, switch to defensive strategy. Tapa is seldom played as a stand-alone game. Together with two other games, Tabla and Gjul Bara it is played in a match of 5 or as long as one of the players gain seven points. A common name in Macedonia and Bulgaria for all three games within a match is Tabla, the same as the first game. The first game is referred to as права (straight [Tabla]) when a need for disambiguation arises. When starting the match, each player rolls one die, to determine who will start. If it's a tie, the players roll again. But, unlike the regular backgammon, the already-rolled dice are disregarded and the player that won the first turn rolls both dice to begin. In the next game in the match, the player that won the previous has the first turn.